What's Up with Wide-Legged Pants? Are you having “trouser troubles” this season? Don’t feel alone! 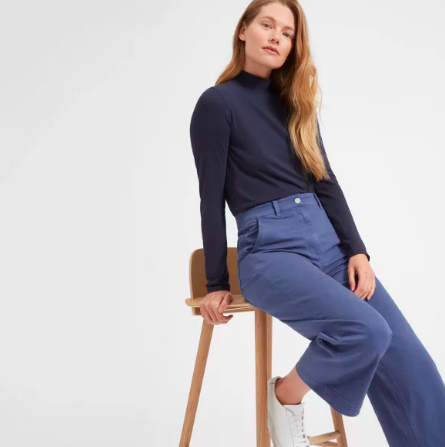 There’s a new look in the stores that’s all about volume and it has so many of you wondering what’s up with wide-legged pants?? And here’s what I figured out: the silhouette of the pant has to flow along your own body shape. So find your shape below and read on for my expert tips. 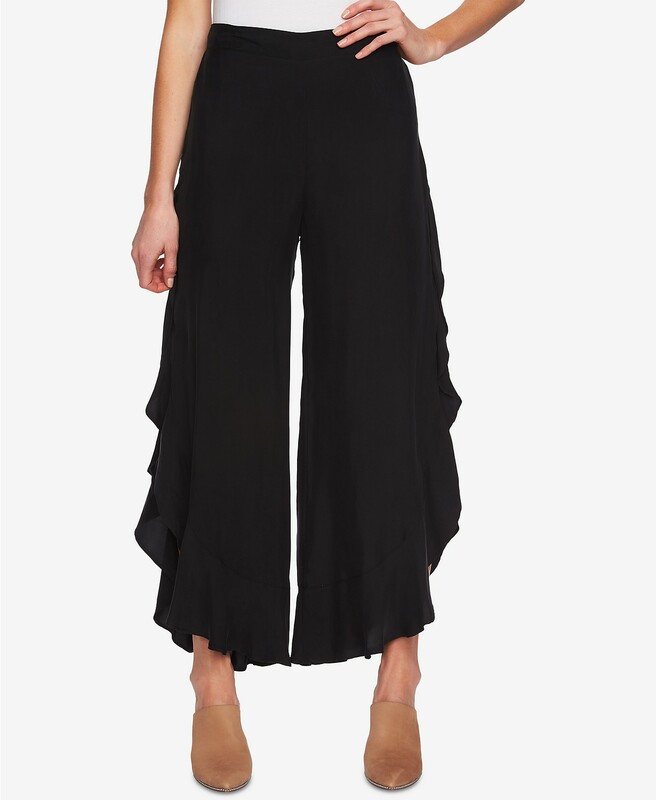 Choose big and flowing palazzo wide-legged pants that are high-waisted and very fitted at the waist. These are wide from the hip down through the leg and are a perfect way for the straight body shape of the Rectangle to have emphasis at the waist. The bow at the waist of the jeans below matches the Figure Eight body shape with the right amount of curve. They have an elegant look that matches the way your body sweeps in and around and down. Wide-legged pants are a challenge on pears. Go for the other new look which is the super high rise skinny jean instead. It shows off your curvy tush and emphasizes your smaller waist. J Brand offers denim with an 11″ rise that’s pretty glam looking. Or try out genie pants with a gathered waist, drop-crotch, volume in the hips and a taper inward down the leg. Make sure the look doesn’t add bulk at your hips though. For curvy bodies, fitted jeans are still the best. 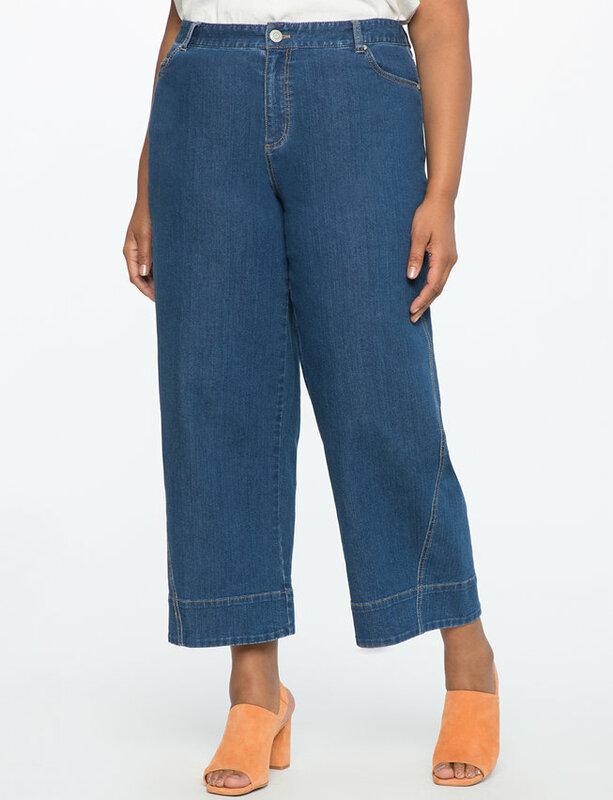 For this body type, add a wide-legged pants look without adding volume. 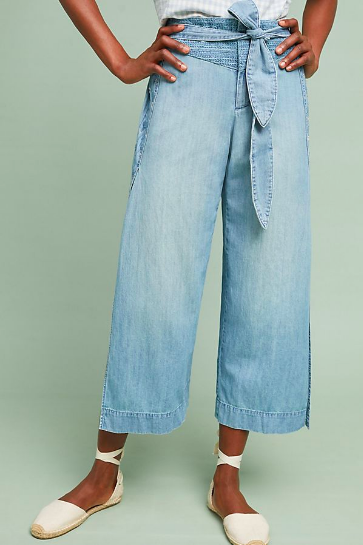 Choose a fitted jean with a split hem or an inset stitch at the hem so you get the look of a flared leg without the volume. The best way for the apple to wear the wide-leg look, is to be moderate about adopting the style. Go for mid-rise rather than super high-rise. Pick a leg that isn’t too wide. And pair the pant with a same color top. Ruffled leg pants and jeans are a great look for this body. They highlight wide shoulders and are dramatic like your eye-catching shape. 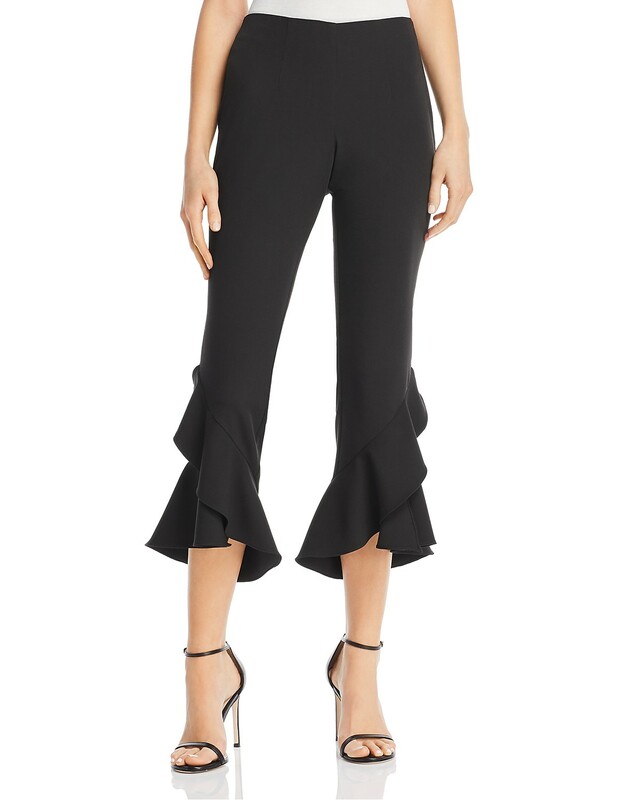 Ruffled leg pants are fitted or straight in the hips and then they have ruffles draping down the leg or flowing across a cropped hem. And if you are just not feeling up to the challenge of getting these wide-legged pants right, then you know I am right here ready to help. I’d love to help you, in fact! 🙂 So skip the overwhelmed-in-the-store feeling and email me back atkerry@thefirstlookimage.com! You know I’m here and happy to help!! And you know too how much fun we’ll have together making you look your absolute best!